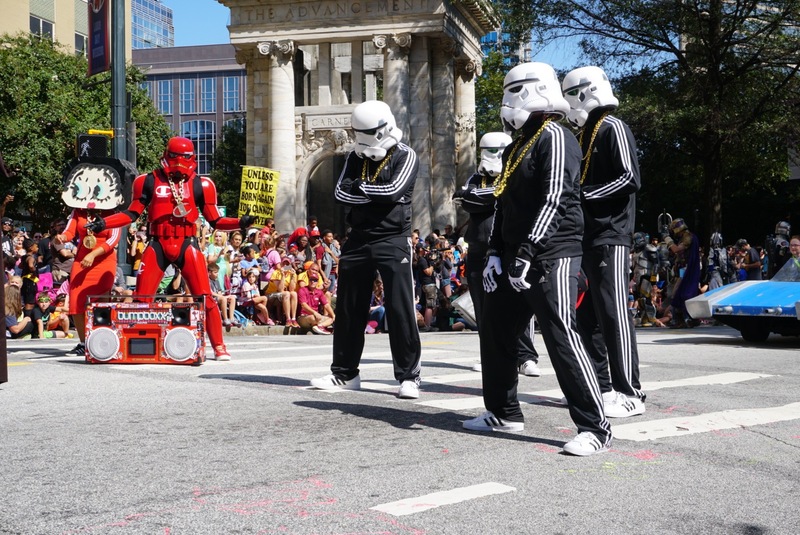 Over 80,000 earthlings spent their Labor Day weekend in Downtown Atlanta for Dragon Con 2017 on Sept. 1-4. The city streets transformed into a whirlwind of cosplay and creativity, as this internationally recognized, multi-genre convention has been a tradition for more than 30 years. At Dragon Con, gamers meet face-to-face, fantasy worlds blend with pop culture, and science lovers hang with sci-fi fanatics. 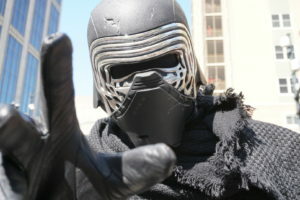 People from all over the world gather in our city to dress up and geek out, creating lifelong memories of fun and fandom. Whether you’re there to show off your homemade costume or sit on the side lines for some prime time people watching, the convention is a place for everyone of all ages. Parties, panels, parades! Dragon Con is an overwhelming, nonstop, action-packed four day weekend. Luckily, the convention’s official app helped attendees schedule their busy itineraries. 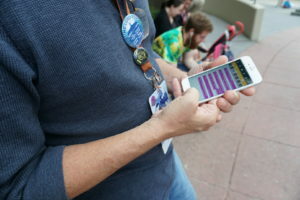 The Dragon Con app also included direct links to social media sharing, event photos, detailed maps and tons of other features that helped people get the most out of their weekend. When asked what he most looked forward to, Kennesaw’s Joseph Ellison said that he could not decide so easily. From workshops with fantasy writers to science events and costume crafting, the convention caters to hobbies of all kinds. 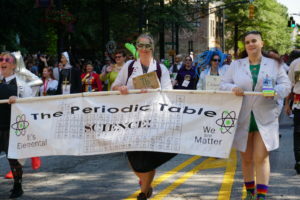 University of Georgia student Breanna Horton has found a place for her science-loving spirit at Dragon Con for the past three years. Horton said that she really enjoyed the “But That’s Impossible!” event, which explained former scientific impossibilities that are now possible due to improved technology. Many beloved pop culture celebrities, authors, artists and actors come to the convention each year to give talks and participate in meet and greets. This year, with attendance hitting a new record high, fans waited in long lines wrapped around the corners of the five Downtown host hotels—Hyatt Regency Atlanta, Marriott Marquis, Hilton Atlanta, Westin Peachtree, and Sheraton Atlanta. Anxious to see their favorite characters come to life, cosplayers passed the time posing for photos and admiring each other’s costumes. Rusty Murphy, from Fayetteville, Georgia strutted down Peachtree St. in his Joker costume—circa Jack Nicholson—waiting for the annual Dragon Con Parade to start on Saturday morning. 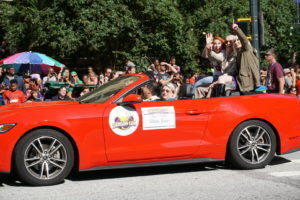 During the parade, the legendary Stan Lee, 94, of Marvel Comics rode in a red convertible through the con crowds. Lee co-created many classic comic book series such as Spider-Man and Doctor Strange. Other notable guests included Lena Headey from HBO’s Game of Thrones, actor William Shatner, and Jon Heder, who plays the title character of the classic comedy film Napoleon Dynamite. Heder helped emcee a Dragon Con costume competition at the Georgia Aquarium on Saturday, Sept. 2. Cosplay, short for costume play, is choosing your favorite character and finding a way to make that character your own. That’s the truth about Dragon Con. It’s not just for superhero wannabes or geeky, basement dwellers. It’s for anyone that wants to play in a world where nonfiction ends and fiction begins. Cosplay is an opportunity to be bold and get creative. This year, it went above and beyond. “My favorite part is being able to see all of the creativity and fandom and ingenuity on display. It’s amazing how much love people put into these projects,” Dragon Con attendee AnnieMee McBride said. McBride, dressed as a character from the online role-playing game World of Warcraft, travelled to the Atlanta convention from Louisiana. 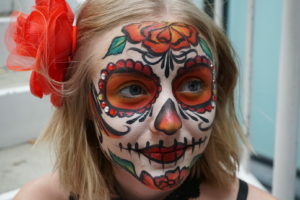 Innovative craftsmanship, body paint, stilts, clever puns (a dragon dressed as a convict)— the list goes on forever. 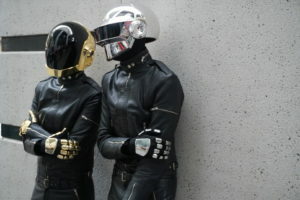 Some people dress to compete, and others dress for fun. Although, the costume contests are not taken lightly. 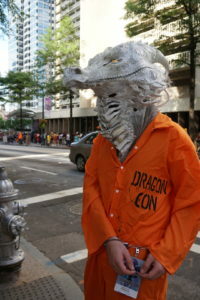 Participants prepare months ahead of time for competitions like the Dragon Con Masquerade, “which is both the oldest continuously run competition in fandom as well as one of the largest in the world,” as said in a statement from the convention’s media relations team. Foam is just one small example of the materials fans use to create unique cosplay fabrications. This weekend saw everything from plastic piping to plywood to LED lights. Lussier said that she plans to wear the costume at Youmacon, a Detroit-based anime and gaming convention. 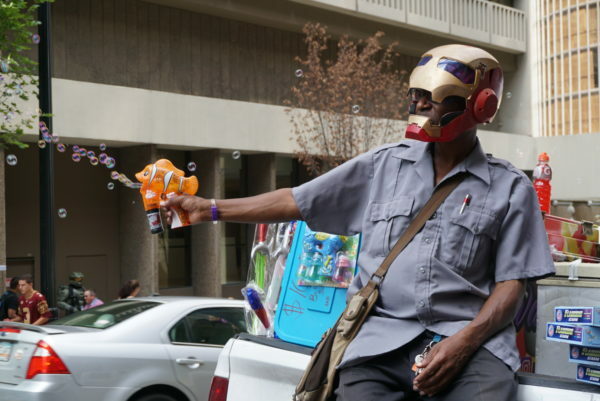 The difference between Dragon Con and other conventions around the country is the fact that Downtown Atlanta becomes a giant melting pot of originality, thanks to the illimitability of a multi-genre convention. There was even some politics scattered throughout the homemade costumes, as well as protesters positioned throughout the streets. 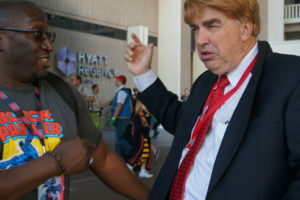 A knock-off Donald Trump was seen chatting with a man in a Black Panther T-shirt (the comic book superhero Black Panther, also conceptualized by Stan Lee). Two women marched confidently with protest signs that read ‘Not my captain’ and ‘She persisted’ with the Resistance symbol from Star Wars stitched on their clothing. 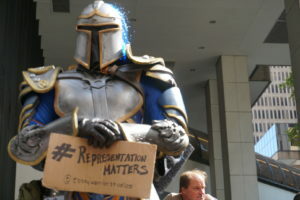 A man in full armor held up a sign that said “#RepresentationMatters” as he posed for photo opps with little kids. “God loves us just as much as he loves you,” one Con attendee screamed in counter-protest. While many Dragon Con goers were on a mission to look their best, Alabama author Jeff Sproul was busy giving out missions himself. Sproul explained that he dressed as his own made-up character: he who gives quests to people as they approach. Once they complete a few simple “quests,” participants get a small reward. Saturday’s topnotch prize was gourmet lollipops and glow sticks. “I wanted to put together a cosplay all my own. And I thought it would be cool to give people stuff because I write in a genre that is called LitRPG,” said Sproul—setting the bar pretty high for being a Dragon Con newbie. LitRPG, or Literature Role Playing Game, is a literary genre that takes massively online multiplayer role-play games (World of Warcraft, for example) and links components with sci-fi fantasy novels. Challenges form a foundational part of these types of games, and leveling up is much like receiving a gourmet lollipop. In addition to the diverse works showcased at the Dragon Con Art Show, there are some attendees that are inspired to make their own art throughout the weekend instead of focusing on costumes. Since the early 90’s, Thomas Tulis has done just that. 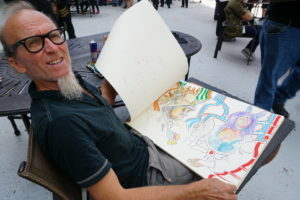 He has preferred to sit and observe from the sidelines, creating live art as he watches the many faces of Dragon Con. With or without costume, everyone had their reason for making the trek to Atlanta for Labor Day weekend—even the out-of-town football fans that looked supremely confused as they walked the crowded streets after the first college game in the Mercedes Dome. Some people spend their holiday weekend grilling hamburgers and soaking up the last bit of summer sunshine, but in Atlanta…we Dragon Con. Get in the spirit. There’s no better way to dive into the traditions of Dragon Con than to do a little cosplaying. Network. Half the fun is meeting new people from all over the world. Talk to fellow attendees—you never know who you’ll run into! Miss Your Favorite Event. Dragon Con is packed with events, so going in with no game plan isn’t the way. Poor planning could mean missing out on something you really want to see. Go Overboard on the Partying. Another huge part of the convention is partying. Keep a good pace and have fun!